By Colin Layde | October 11, 2013. 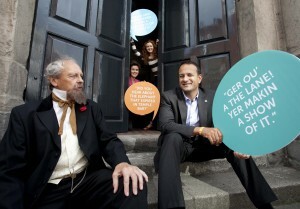 Fáilte lreland in conjunction with the Office of Public Works are currently developing tourist trail Dubline. The heritage trail will cost €4 million and when completed will run through the Liberties, starting at Stephen’s Green before finishing in Kilmainham. It is hoped that Dubline will provide visitors to the capital with an enhanced experience by establishing an integrated tour of the city’s cultural and heritage sites. Fáilte Ireland believe that the trail will bring more tourists to the attractions and businesses along the route. The plan also recognises the need for restoration work to be carried out on Thomas Street. The street which is the commercial, social and cultural hub of the Liberties, has gradually begun to show signs of urban decay over the years. The Dubline project commits to having transformed the street by 2020. A free mobile phone app for both iPhone and Android devices is also available to help guide tourists around the capital. At each stop along Dubline the app presents the user with an audio story or video content about their location. Minister for Transport, Tourism and Sport, Leo Varadkar said he believed the trail would bring the city’s history to life. Tourism is currently worth over €1.5 billion to the city’s economy and it is hoped that initiative such as Dubline will see a further increase in the figure. Fáilte Ireland CEO, Sean Quinn said that Dublin was hugely important to Irish tourism with three quarters of all visitors to the country staying in the capital during their stay.